I love college sports so I cannot help but fall in love with this time of year!! In Spain March Madness doesn’t exist, which breaks my math teacher heart. Why, you may ask? Because March Madness is the BEST time to teach/review/explore fractions, decimals, and percents!! Last year I used Miss Nannini’s March Madness packet and absolutely fell in love. It’s so simple to use. I started off by having my students fill in their own brackets. I took the time to explain step-by-step how they should be filled in. Even students without any basketball knowledge can do this. Next, we took blank brackets to school administrators and convinced them to fill one in for us! Even the gym teacher and our principal got involved! We posted their brackets on the bulletin board in the hallway so the whole school could follow. Using the brackets, we had fun completing Miss Nannini’s unit- but we even took it a step further. As the tournament went on we kept track of our predictions. For each game guessed correctly in the first round, students got 2 points (you can go higher to make the numbers more challenging- as long as you stick to the same numbers for everyone), 4 points for the second round, 8 points for the third round, etc… Every few days we would update our brackets and see who was in the “lead”. This made the unit feel more purposeful because they wanted to see the likelihood of winning as the class “best guesser”. 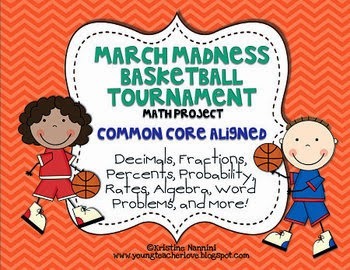 If you’re interested in some more ways to celebrate March Madness, one of my favorites is what I call Math Madness! It’s a super easy review/practice game but students LOVE to play it. All you need is a microphone (aka anything that you can hold and pretend to speak into), a review sheet, and Jock Jams Instrumental. That’s right- think Bugs Bunny and Michael Jordan rockin’ out. 4) You may stand up and dance silently when, and only when, you have completed your work. – This strategy works best if you allow a little extra “dance time” after each problem. Otherwise mathaticians rush right through their work. Then, write a problem on the board. If using a review sheet, just write a problem from the page. Powerpoints work well too- if you’re one of those uber prepared type of people (not me usually!). I love to have the music quietly playing as students walk into the classroom or at the start of math. One person hears it and it builds the excitement and they get so excited over math! Ha. I keep the music quiet throughout the game so it doesn’t become distracting, but it definitely makes it all more fun. One student comes up to the board to solve a problem. While they do the work, other students check their work by solving the problem themselves. While they all work, I walk around and check their work. This also gives me time to work briefly one-on-one with students and provides great anecdotals! When a student finishes their problem, they may stand behind their chair and dance silently! When everyone is ready to discuss, we stop dancing and we check the students work and discuss the answer. When they finish, I say, “Mrs. Jamie, you are now the proud owner of a fresh-off-the-press, handwritten, check! !” And we all clap and they join their classmates and the game goes on. I keep track of who I call up to the front so everyone gets a turn (even if it’s not all that day). This is great to play right before a big test because you get time to review and discuss problems but it also gives their brain a little break from the book work! Do you celebrate March Madness in your classroom at all? What do you do? And don’t forget to stop by this weekend to participate in our giveaway! !